58297 Bargellini Madonna Bargellini Madonna (1588) Oil on canvas, 282 x 188 cm Pinacoteca Nazionale, Bologna. (Bologna 1555-1619) Painter, draughtsman and etcher. His father, Vincenzo Carracci, was a butcher, whose profession may be alluded to in Ludovico's nickname 'il Bue', though this might also be a reference to the artist's own slowness. Ludovico's style was less classical than that of his younger cousins Agostino and Annibale, perhaps because of a mystical turn of mind that gave his figures a sense of other-worldliness. Like his cousins, he espoused the direct study of nature, especially through figure drawing, and was inspired by the paintings of Correggio and the Venetians. However, there survives in his work, more than in that of his cousins, a residue of the Mannerist style that had dominated Bolognese painting for most of the mid-16th century. Ludovico maintained a balance between this Mannerist matrix, his innate religious piety and the naturalism of the work of his cousins. 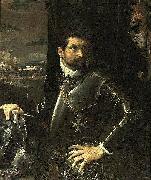 With the exception of some travels during his training and a brief visit to Rome in 1602, Ludovico's career was spent almost entirely in Bologna.